There are horse people and non-horse people. I am a horse person. I loved horses from birth. I said the word horse (“horsie”) before I said “mama” or “dada”, I had dozens of horses (imaginary, plastic, furry and hobby) throughout my childhood and happily, real horses came in to my life at an early age and I never looked back. Gymkhanas, trekking, show jumping, one-day eventing and eventually teaching followed. I am a horse person. My daughter, too, found her passion for horses - later than me, but no less strong than my own. She too is a horse person, happy just to be near them. My husband, however, is not a horse person. He was first persecuted by equines at the tender age of 9 when he was asked to ride one by his mum, who suggested he go riding with his sister as he might like it. No. He HATED it from the first. He didn’t like anything about it. The horses were big and smelly. They trotted and he bounced painfully on his bottom and the teachers were horrible to him. It was a drab stables in London with nothing attractive about it. He cried. His sister laughed at him. He didn’t go again. Horses continued persecuting him into his adult life. When walking in the countryside in Wales, where his family had a cottage, he would regularly encounter horses blocking his route, the size of houses (or horses), shuffling their feet in preparation for attack, showing their teeth as they blew flames from their nostrils and looking at him funny. And FOLLOWING him! WHY would they DO that?? He always found a quick escape and would abort his walks if there was no horse-free route. Then he met me, during a period when I wasn’t really doing anything horsey. The poor man. Tricked. We moved to France and I refound my horse world with a vengeance, and my daughter soon joined me. Now he finds himself a lone artist in a horse-obsessed family, with tack, boots, loose hairs and straw filling every corner of his house and a wife and daughter happy to discuss anything equine at the drop of a (riding) hat. For a while he put his foot down and banned all horse discussions at the dinner table on the basis that it was just too boring (and, speaking as a person who falls asleep at the first mention of perspective, colour, contrast, or anything art, I can sort of see his p.o.v). 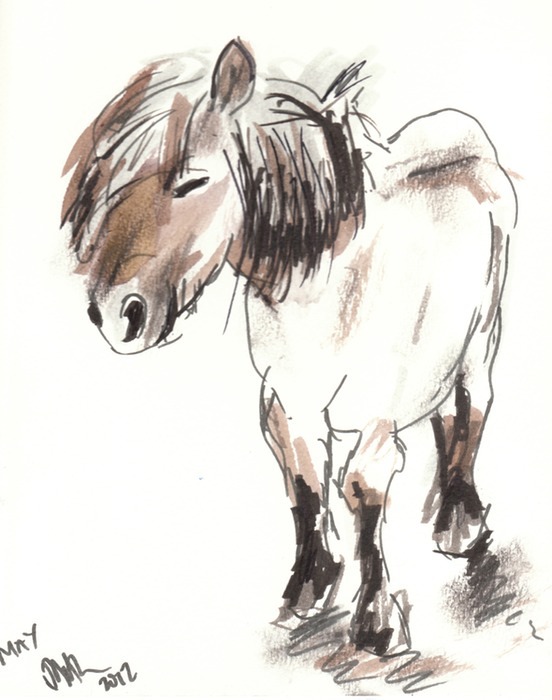 Then he realised he was fighting a losing battle and did a couple of beautiful drawings and paintings of the family equines (from photos, since he would never go nearer than two or three kilometers from them). Then, about six weeks ago he happened, completely by accident, to find himself inches from my beautiful fjord mare, who shoved her nose at him to introduce herself. Automatically, he reached out his hand to stroke her nose and said “hello, May”, before realising what he had done, and backing up fast! Maybe there is a horse person somewhere in all of us?